At Adriano Carbone, we offer an Australian made suit for any given occasion. For a better fit than off the peg suits, experience the difference with a men’s custom made suit from Adriano Carbone. Our options include made to measure suits, custom tailored suits and bespoke handcrafted suits. Welcome to the world of tailor made suits. We offer an experience unlike any other, with a garment that is specially made for you and hand crafted in house. We can assure that you will feel as if you are in a world of your own when you experience your first fitting, even as the garment is only 50% constructed. Additional fittings offer the true tailor made suit experience. You’ll love the finished product. Welcome to the world of yesteryear. If you are a suit connoisseur, and like the best of the best, we can assure you that our bespoke men’s suits offer an experience unlike any other. Our handcrafted bespoke suits take over one hundred hours to produce. These suits require several fittings, which gives you a greater appreciation of the work involved. 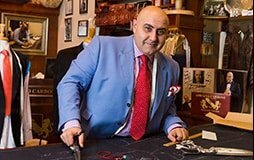 If you have the time to be transported into our world of bespoke handmade suits, please make an appointment. We guarantee you’ll enjoy the experience. The Adriano Carbone made to measure suit for men is our most popular product. Choose from a range of options including fabrics, styles and construction. Illuminate your possibilities with all of the options available with our made to measure suits for men.